Alabama junior Calvin Ridley has totaled 1,814 receiving yards through his first two college seasons, but his productivity dipped late last year when the Crimson Tide struggled to throw the ball. Imagine Alabama and Georgia living up to projections in their respective divisions and meeting in the 2017 Southeastern Conference football championship game. What a December day that would be for Kassna Daniels, the single mother of Alabama junior receiver Calvin Ridley and Georgia sophomore receiver Riley Ridley. 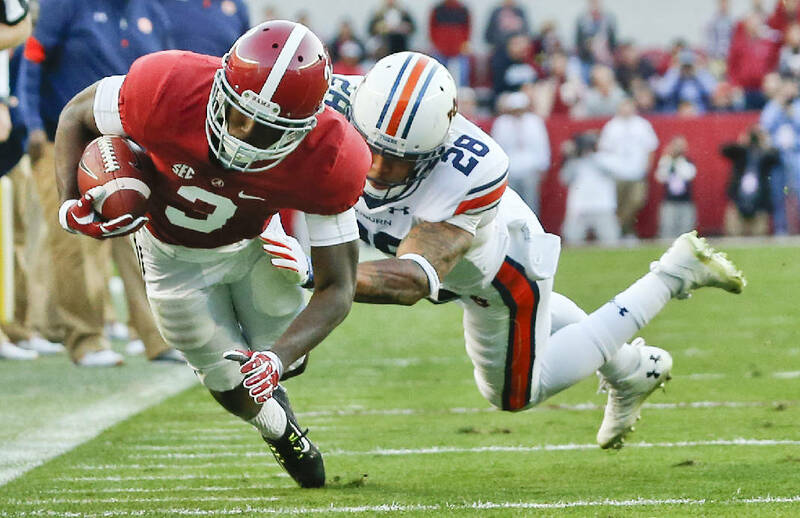 "I don't know what my mom would do," Calvin Ridley said this past week at SEC media days. "I'm obviously going to want to win the game, and he's obviously going to want to win the game. At the end of the day, it's my brother and I love him, but I don't know what my mom would do." Alabama's Ridley has been in SEC title games since signing with the Crimson Tide as the No. 1 receiver nationally in the 2015 class. This is the first article in a series taking a look at Southeastern Conference teams. The next article will appear Monday and will focus on Arkansas. Fun fact: Alabama led the SEC in scoring offense and scoring defense last season for the first time since 1980. The 6-foot-1, 190-pounder from Fort Lauderdale, Fla., arrived in Tuscaloosa on the heels of former Alabama receiver Amari Cooper finishing third in the 2014 Heisman Trophy balloting. Ridley quickly picked up the slack, amassing 89 receptions for 1,045 yards and seven touchdowns for the 2015 national champions. Ridley's total broke a freshman record that Cooper had set in 2012, but he was not as busy last season as a sophomore, when former offensive coordinator Lane Kiffin built the attack around the running talents of dual-threat quarterback Jalen Hurts. Alabama went from averaging 35.1 points and 427.1 yards per game Ridley's freshman season to 38.8 points and 455.3 yards per game last year, but Ridley's totals dipped to 72 catches for 779 yards yet still with seven scores. "I guess I would say I kind of rolled with it," Ridley said. "We were winning every game, so I was very happy about that. We went to the national championship game. Sometimes you have to sacrifice to make things better." By the time the Crimson Tide reached the four-team playoff, however, the talented Ridley had nearly disappeared due to Hurts struggling more against tougher defenses. In the Peach Bowl semifinal triumph over Washington and the loss to Clemson in the national title game, Ridley had a combined six catches for 42 yards. The drastic difference in aerial attacks between Clemson and Alabama in January resulted in 11th-year Tide coach Nick Saban bestowing a primary chore of an improved passing game on new coordinator Brian Daboll, and that transformation appears to be taking place. "Jalen has done a good job in the offseason of becoming a better passer and understanding the passing game better," Saban said this past week. Alabama isn't about to get away from its rushing assault with the likes of Damien Harris, Bo Scarbrough, Josh Jacobs and heralded freshman Najee Harris available in the backfield. Yet repeating the diminishing productivity of Ridley is something Saban is determined to avoid. Daboll came to Alabama with NFL coordinating experience and was tight ends coach last season for the Super Bowl champion New England Patriots. "I wouldn't say it has been too different," Ridley said. "We're going to be doing a lot of the same things, but Coach Saban brought Coach Daboll in and he knows what he's doing. We'll just have to see, because I think there are going to be some really good things out there that we're doing." Despite losing the likes of O.J. Howard, Cam Robinson, Jonathan Allen, Reuben Foster and Marlon Humphrey from last season's 14-1 team, Alabama had a record 10 All-SEC first-team preseason selections this past week at media days. Alabama enters this season having won 17 consecutive conference contests, including the past two SEC title-game drubbings of Florida. "I just think if we go out there and work hard in camp and get better and get the leadership going and come together as one, I don't think we should have any problems," Ridley said. "I know there are some great teams out there. We've just got to play hard." And if Alabama and Georgia collide in the first SEC title game held in Mercedes-Benz Stadium? "My mom would probably wear half Georgia and half Alabama or something like that," he said.